Afiny Math left school at an early age to help her family. A Phnom Penh native, Afiny made many attempts to return to school but faced serious challenges due to limited financial resources. Afiny applied to the English Access Microscholarship Program in 2006 and was selected for the two-year after school program where she studied English and gained an appreciation for U.S. culture. The Cambodian Islamic Youth Association (CIYA) administered the Access Program Afiny participated in, and after graduating from the Access Program CIYA asked Afiny to join their organization as administrative support staff. Today, Afiny helps coordinate the Access Program for CIYA and selects the new class of students. Today, Afiny continues to give back to her community and is a role model for new Access students in Cambodia who face similar challenges to the ones she faced. 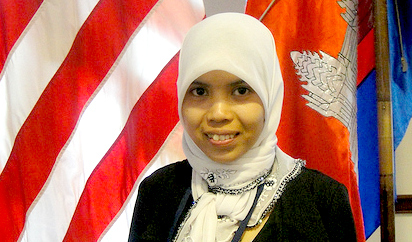 Afiny recently participated in an Access Coordinators Workshop at the U.S. Embassy where she represented CIYA and met many other Access coordinators and teachers from Cambodia.